Using Quick View form in CRM 2013 to show filtered set of related records. Recently we had a requirement in our project where on the opportunity form, when the sales manager selects the account, the system should show the list of activities related to the account. The requirement looked very interesting and the first thing that came to our mind is to utilize the Quick View form to achieve the same. The following are the list of steps of what we did. 1. 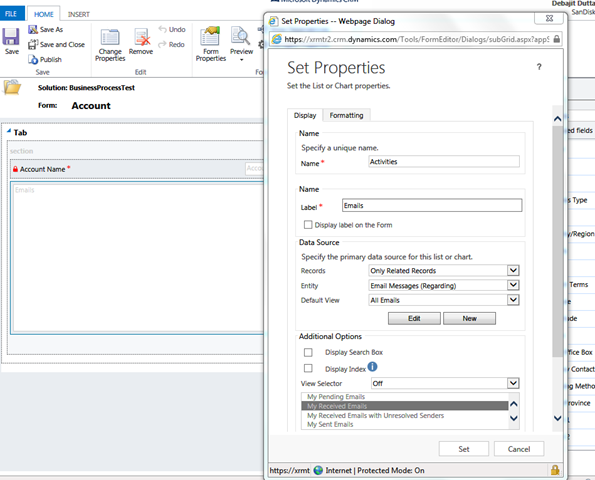 Created a quick view form for the account entity with Account Name and activities sub-grid for the account entity. Check for the screenshot below. 2. Inserted the Quick view form of the account in the form of the opportunity entity. 3. The result is when the Sales Manager selects an account while creating the opportunity, he is able to see the list of the related activities for the account. Check for the screenshot below. The user was able to even add new email messages through the sub-grid. Using this Quick View feature, we could resolve this requirement with very little configuration.